Relax and feel restored with this Restorative Yoga course. Prioritise your health and wellbeing as you are guided through a range of complementary restorative Iyengar yoga sequences that will soothe your nervous system. These lessons focus on supporting you so that you can learn to relax and let go of tension in your body and your mind. With regular practice, restorative yoga can be a powerful tool for reducing stress. It also helps you to rebalance during times when you are feeling lower in energy and needing to rejuvenate. This class takes you through a classical Iyengar Yoga restorative sequence. A number of the more well known and widely practiced restorative poses are included. The set up for each pose and the arrangement of associated yoga props are taught in detail. Breath awareness is emphasised throughout the class. Methods for deepening relaxation are also explored. The focus in this sequence is on chest-opening restorative poses and pranayama. The class culminates in a variety of pranayama techniques performed in both the lying and seated positions. Practice lengthening your breath in the reclining savasana position. From there you will head in the direction of antara kumbhaka with viloma breathing. 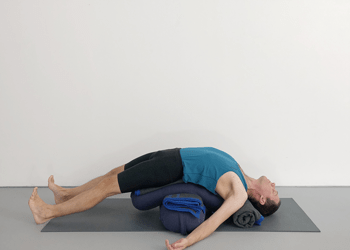 These restorative poses emphasise relaxation of the abdominal region. This type of sequence is commonly practiced by women using the Iyengar method during menstruation. During this time inversions and poses that compress or harden the abdomen are avoided. Practice sequences are given an energy preserving emphasis. This class shows one way that such a sequence can evolve. Although often used in relation to womens health, this style of class will also be enjoyable and beneficial for men. Restorative Iyengar yoga inversions are emphasised in this class. Supported chest opening poses that focus on breath awareness, as well as some passive, hip opening poses, are also included. Many of the poses in the sequence use yoga props in specific ways to support the body. The set up, and correct usage of these props is explained in detail for each pose. Restorative yoga is stress relieving. This course will help you to slow down – bringing stillness and clarity to your mind, whilst soothing and calming your nervous system. Classes can be used before bedtime to assist with sleep. They can also be used to restore balance whilst recovering from illness or injury. Focus: This class consists entirely of Iyengar Yoga restorative poses. The class will be great for helping you to relax and de-stress. A sequence such as this will be beneficial for various reasons. It might be that you practice these poses because you are feeling lower in energy. It might be that they help you when you are feeling unwell. You might use these poses as a way of preparing for pranayama. If you are someone who more regularly practices active, stimulating poses then this sequence might be just what you need to bring to bring back some balance. A number of the more well known and widely practiced restorative poses are included in this class. The set up for each pose, and the arrangement of associated yoga props is taught in detail. Breath awareness is emphasised throughout the class. Methods for deepening relaxation are also explored. Focus: Pranayama and restorative yoga are the main focus of this class. The class culminates in a variety of pranayamas performed in both the lying and seated positions. Chest opening restorative poses make up the first section of the sequence. These poses help to bring relaxation to your body and an inward focus to your mind. The set up for both setu bandha sarvangasana and viparita karani are explored in detail. Pranayama begins in the latter part of the class. Initially you are guided in how to lengthen your breath in the reclining savasana position. From there you head in the direction of antara kumbhaka where you retain your breath after inhalation, and eventually add pauses to your inhalation with viloma breathing. These same pranayamas are then developed in an upright seated position. Although tagged as an advanced class, this sequence will also benefit less experienced students with a genuine interest in the breath component of Iyengar Yoga. Key Poses: Ujjayi pranayama, antara kumbhaka, viloma pranayama, savasana. Focus: This class focusses on restorative poses that help to relax the abdominal region, and soothe the nervous system. This type of sequence is commonly practiced by women in the Iyengar method during menstruation. During this time inversions are avoided; as are poses that compress or harden the abdomen; and practice sequences are given an energy preserving emphasis. This class shows one way that such a sequence can evolve. Although often used in relation to womens health, this style of class will also be enjoyable and beneficial for men as well. This calming, rejuvenating class will also help to promote relaxation and combat stress. Focus: This class includes a number of restorative Iyengar Yoga inversions. It also contains supported chest opening poses that focus on breath awareness. Several passive, hip opening poses are also included. Many of the poses in the sequence use yoga props in specific ways to support the body. The set up, and correct usage of these props is explained in detail for each pose. The class as a whole will help to bring stillness and clarity to the mind, whilst soothing and calming the nervous system. Hi Rod, a quick observation and hopefully a suggestion. 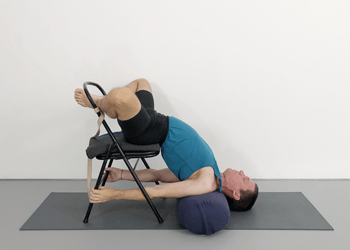 I have just done your Inversions/ Restorative sequence. At times I found it hard to see you and the “set-up” because the bolsters were black, the blankets were black and you were wearing black. In class it is easier to see, but difficult to see as a download. Perhaps different coloured bolsters, grey or white blankets would help. Thanks for your feedback. This has been mentioned before. It is a little tricky as blankets are generally dark grey/black. I have recently purchased some bolsters that are lighter in colour and will be using them soon. Hopefully this helps.